100% wild-caught fillets seasoned with lemon and black pepper. It’s only natural to crave better food, and with our Lemon Pepper Grilled Fillets we make it easy to satisfy your craving. 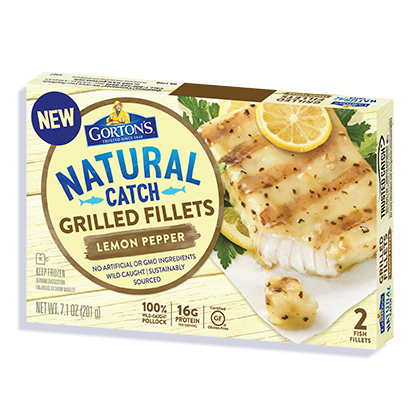 Seasoned with lemon and black pepper, these sustainably wild-caught fillets are grilled to perfection and made with no artificial ingredients. 3. Bake for 18 - 20 minutes*. Important: Microwave wattages vary, times are approximate. *FULLY COOK FISH TO AN INTERNAL TEMPERATURE OF 165ºF OR HIGHER BEFORE SERVING. Water, canola oil, potato starch, butter (cream, salt), sea salt, cane sugar, black pepper, nonfat milk, potato maltodextrin, citric acid, natural flavor, lemon peel.